On behalf of the dedicated public safety professionals of the NIU Department of Police and Public Safety, I am proud to announce the launch of the NIU Community Safety & Emergency Response educational program. The program can be accessed free via the internet at http://www.learn.niu.edu/niusafety/v2014/index.html. Safety in our community is a shared responsibility. As part of your learning and living experience at NIU I encourage all community members to take a moment to learn what to do in an emergency. The website was a result of collaboration between police, public safety emergency management specialists, and NIU eLearning Services. The user-friendly online learning system is available to all community members and provides relevant information on important safety topics to all of our campus community. Each presentation is provided as an educational resource on what to do in case of a campus emergency. Please take a few moments and learn how you can be better helping our community by being informed and prepared in an emergency. 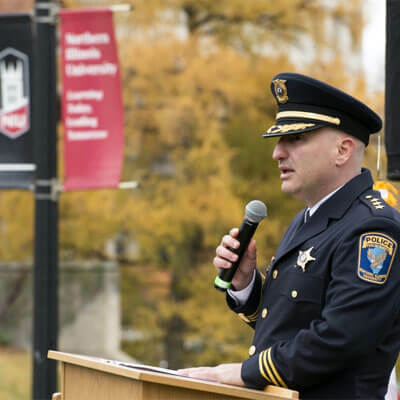 Thomas Phillips, Sr. is NIU’s chief of police and oversees the NIU Department of Police and Public Safety.